Earlier today, the Crown Melbourne released the 2014 Aussie Millions schedule. The tournament series, which is set to be held in the Crown Melbourne in Melbourne, Australia, will from Thursday, January 23rd until Monday, February 10th. A total of 20 events will comprise the 2014 Aussie Millions schedule - the first event ($1,100 No Limit Hold'em) will get underway on January 23rd, while the last event ($250,000 Challenge) will get underway on Sunday, February 9th. 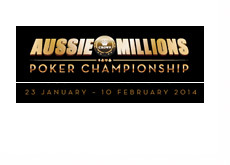 The 2014 Aussie Millions main event will get started on Sunday, February 2nd. There will be a total of three opening day flights, with the flights set to merge today on Day 2 (Wednesday, February 5th). The main event will wrap up on Sunday, February 9th.